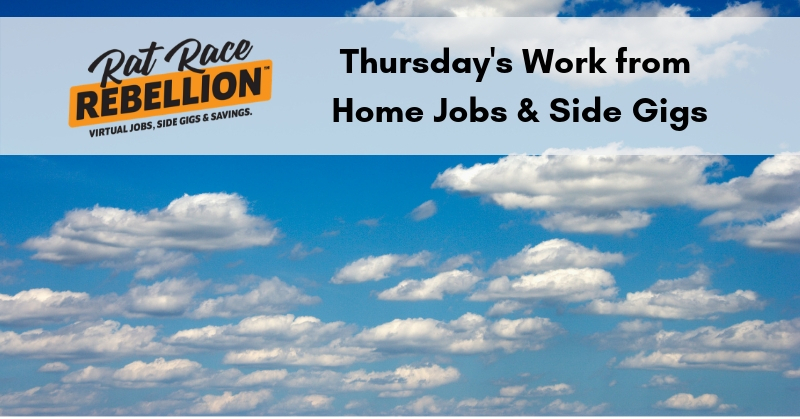 Work from Home Customer Service Agents – GC Services: For these openings the company is hiring from DE, ID, IN, IA, KS, KY, ND, NE, NM, NV, MT, OK, PA, SD and UT. Pay starts at $12.50/hr. HS diploma or GED required, six months of customer service experience preferred. Full-time or part-time not mentioned. Calling All Face Painters, Balloon Twisters, Costumed Characters – GigSalad: Looking for gigs? GigSalad is a marketplace for Entertainers and the people who need them. “We Got Hired!” — Congratulations to the latest RRR jobfinders! From our inbox and FB page — “I just wanted to say Thanks to Rat Race Rebellion for all the leads in finding a Work from Home job. I got hired with Amazon and i start April 19th! I can not wait!! !” Cristie Merritt posted. “Hi! Just wanted to say thank you for all your postings and let you know that I got hired at Amazon to work from home pt @$15/hour!” Adriana C. wrote us. “Was just hired at NexRep for Grubhub,” Lashay posted. “Got hired with KellyConnect whooo hooo…. start training on Monday super excited your site rocks…” Rashaunda Smith posted. “I got a job with Lawnstarter through Rat Race Rebellion. Love my new job. Best call center I have ever worked at. Thanks Rat Race Rebellion!” Sara Sanchez posted. “Hi! Just letting you know that I was hired by ExecOnline as a part-time Student Retention Specialist and I start tomorrow!!! Thank you for including them in your email!!!! Janelle K. wrote us. Well done, everyone! We hope you love your new work from home jobs! Get Paid to Rate Customer Service Agents – Customer Service Review, Inc.: “Customer Service Review, Inc. specializes in the development and improvement of customer service, sales and retention skills of front-line call center personnel. They’re recruiting part-time people to evaluate call center agents. No state hiring restrictions mentioned. No college needed, training provided. Extra points if you have customer service, mystery shopping or call monitoring experience. ← GC Services Hiring Customer Service Reps, $12.50/Hr.